I don't know about you guys, but I've already got that Gumby holiday feeling—you know, like you're being stretched in all directions. I'm trying to get gifts for the family and the kids, get the cards sent out, decide what to give the teachers and Max's therapists, ETC. ETC. ETC. Usually, I only have one cup of coffee a day (iced, light and sweet) but every December I inevitably go to two. I'm figuring you could also use a little extra caffeine running through your veins right about now. Ta-dah! 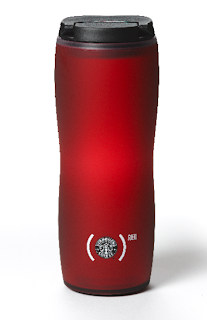 Starbucks generously offered up five gift sets, each worth $40. 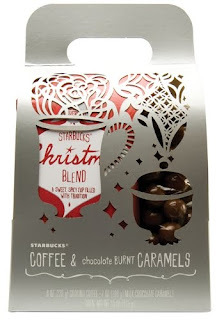 They include a Coffee & Treats Gift Pack, above, with an 8 oz bag of Starbucks Christmas Blend and Chocolate Burnt Caramels (BONUS SUGAR RUSH!!! ); a tumbler; and a one-pound bag of Whole Bean Brown Spice & Citrus Coffee. You probably shouldn't drink it all in one sitting. To enter, leave a comment below answering this question: How do you like your coffee? • Follow this blog on Blogger (*only for those who aren't already following it*). • Come over to my house and brew me a nice cup of coffee. KID-DING. This giveaway is open till Friday, December 11th at 11:59 EST. I'll pick five winners via randomizer.org, announce them here on December 12th and contact you by e-mail; Starbucks will mail out the gift sets. Note, you must leave your e-mail if you do not have a Blogger account so I can contact you. Open to U.S. and Canadian residents. Shameless plug: Today is the last day to vote for this blog on Divine Caroline's awards. So if you're feeling all caffeinated and awake, could you head over there and vote? Much obliged. I love black iced tea with no sugar and no added water...Just plain black tea over ice for me! That is funny, I have just upped mine from one to two a day too, go figure! Thanks Ellen for sharing.Wish you a Happy Christmas n New Year ahead. I've been lurking but the idea of coffee makes me come out from the shadows. I read your blog religously. I love a chai tea latte - iced or hot. yum! Starbucks Caramel Machiato, and I voted for you. I am off coffee right now because of the gestational diabetes, so I'll be honest and say I'll take coffee ANY WAY I can have it once this baby is out!! But my very fave is a lovely iced mocha ;-). I don't drink coffee. Prepare yourself...I've NEVER EVER had Starbucks. GASP! Friends tell me to try it, that I can make it not taste like coffee as I know coffee, but I never have. I have, however, been drinking a diet Dew for breakfast this week, which is usually reserved for the random morning when I just can't move. Every morning this week. I would probably give this to the BFF for Christmas. BUT my mom does & I would give this to her. MMMM That coffee looks divine! I already subscribe through Bloglines! I like my coffee strong and black.That's what wakes me up in the morning. Peppermint Mocha flavor is wonderful. Starbucks coffee is the best! I like it with a vanilla cooler. I tend to like cooler drinks. Hot coffee I like strong and black, but I also love iced Americanos with extra ice--also black--year-round. Oh, and I also love the occasional Irish coffee! I like my coffee with a lot of cream and a little sugar. With cream and not too hot. I like my coffee strong, and either black or with a bit of cream (never sugar). I do like some other coffee drinks, but I don't really think of them as coffee. I love coffee, and I love it any way, except black!! I'm addicted to the iced caramel macchiatto but lately I've been drinking the hot caramel brulee. Yummy! I once heard someone say "coffee doesn't have to taste good - it just has to do it's job". I totally disagree. One of my great pleasures in life is a great cup of coffee. I usually only drink ice coffee in the summer (it is my special summertime treat). Otherwise, I take my coffee with milk (whole milk) and 2 splendas. If I am extra lucky, I will also share it with good company or something sweet to eat (cookie, muffin etc.) or both together!!! Pure ecstasy. Thanks for always having such a great blog and for these cool giveaways. I roast my coffee in the oven every couple of days, then grind is down fine and brew it in a 5 cup mr. coffee at 1 scoop per 5 oz. water. That's how I like it too. I really like coffee as a mocha frap but my sister loves to have it with some sugar. I like coffee in a candle...I dont drink coffee, but love the smell...so why am I entering, my close friend loves starbucks! I am not a picky coffee drinker. It's bad, but I will even heat up a cup of coffee in the morning from yesterday's pot! I just need that morning jolt. with lots of coffee creamer! I love trying all different kinds of coffee. I always like my coffee black! I Love a Steaming Hot Chai Latte! I like it in the form of a peppermint mocha with whipped cream! Yum! My husband makes me coffee each morning and then I add a splash of flavored creamer! I subscribe to your site by RSS feed. I voted for you, I was vote 25!! Good Luck. Light and sweet is my daily coffee. My treat right now is Starbuck's peppermint mocha. OMG it is getting me through some rough days. I drink my coffee with half cocoa.. I like it strong, with cream and sugar. Love espresso! I like iced coffee with flavors like hazelnut. I joined the facebook fan page. My facebook username is Chelsey Burke. I like anything sweet... at least a 50/50 sugar to coffee ratio. Cream, toffee, cocoa, etc are all suitable additives. My hubby likes his coffee anyway he can get it! I like mine flavored or with cream. Just never drink it plain. Oh this has my name written ALL over it! ;) Thanks for this opportunity, Ellen! ...and now I am a Facebook Fan! Really strong with 1/2 and 1/2. One (big) mug a day that I savor like you can't believe. I love iced coffee with raspberry and chocolate..
hot coffee with chocolate and vanilla shot.. I like my coffee black with a little sugar. What types of gifts do you normally give Max's therapists? I admit that last year I was too exhausted and overwhelmed to even think of giving my son's therapists a gift or even a card. This year I'm scrambling for ideas. I don't have the time or skills to bake anything and my son is too young to make them a crafty gift. Maybe that would make a good blog post? I'd love to hear your ideas! fully leaded! unflavored- with plenty 'o real sugar and real milk. mmmm. At home, I'm too lazy...so it's black with one sugar! I'm an FB fan (under my name, Piroska). I like my coffee with biscotti! Strong, with 2 creams and sometimes honey. at Starbucks I like a white mocha, whole milk and whip! I like it Iced Coffee. I love my coffee with a tsp of demerara sugar and a lot of milk! With vanilla syrup and almond milk. I like it hot and I like it made correctly. Something my local Starbucks seems to have a problem with. Coffee sounds great! The 11th is my son's birthday, so here's hoping it brings us luck! I like my coffee with a dash of half and half, no sugar. Black - pure and simple. Black and free is even better. I hope I win. I like mine hot, strong with Splenda and creamer. I like my coffee back and strong. Thanks for the chance! Regular coffee has to be black, but I do like Starbucks Pumpkin Spice Lattes! Thanks for this nice giveaway, and regardless of if I win or not, God Bless little Max who seems like a trooper for sure! My coffee has to be flavored. I love to add french vanilla creamers to it or when I'm really indulgent, White chocolate. I take my coffee as Hot Chocolate, my husband is the coffee junkie. This is a fabulous prize giveaway! especially our oldest son who is away at college. There is a Starbucks on his campus and he loves to stop in there on a cold day for a hot drink in between classes. Usually, I like my coffee with rich cream! I'm a Facebook fan (Merri)! I love coffee with french vanilla creme added! If *I* make it, I like it with milk and flavored creamer on ice. I like my coffee strong and extra hot and with one tsp sugar or honey. I like my coffee with flavored creamer and sweetner. Currently I am drinking yesterdays coffee, over ice with eggnog as my creamer. It is good...trust me! I generally do iced, with coffeemate creamer (flavored) or International delight. And generally iced..even in the winter! A dark roast with alot of creamer. 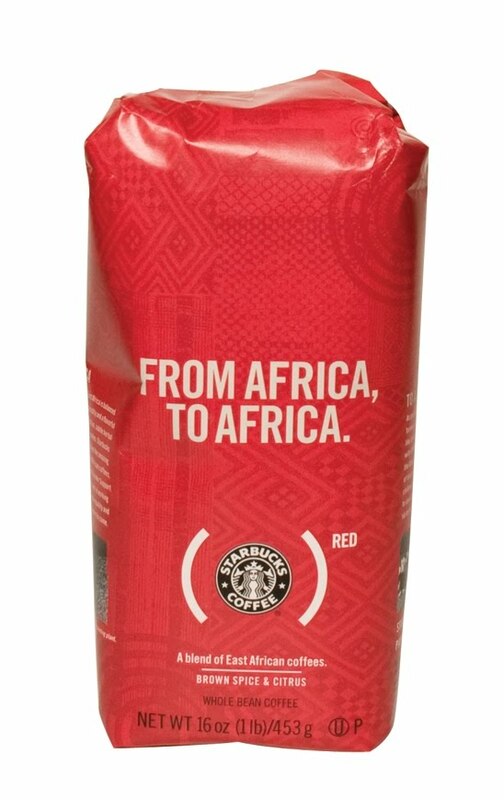 From Starbucks - triple grande latte, At home I love a rich dark roast with hot frothed milk, sprinkled with a little cinnamon sugar. Heavenly! I usually just drink it with half and half and splenda but I love flavored coffees also! I like my coffee mostly iced. But I start every morning with hot espresso and milk. I like the plain brewed coffee with sugar and flavored creamer. But at Starbucks I'm a huge fan of the mocha with skim or skinny chai! I like my coffee black, strong, and often! I joined and added you to my blog list and grabbed your button. I've been meaning to anyway. I love my coffee just plain and hot. Actually, I prefer my cream and sugar with a little bit of coffee. Thanks for the chance! I like it many differnt ways. If I am eating something sweet, I take it black, but if I am eating something savory, or just drinking it on its own, then I prefer either soy milk or almond milk added. I like it black... but I like flavored coffee the best, especially holiday flavors like sugar cookie and pumpkin spice - YUM! Thanks so much for the chance to win, I'd love, love, love to have one of these great gift sets!! I love mint mocha with soy milk. If I am drinking coffee at home I prefer it flavored with nondairy creamer and sugar. I like mine with Sugar in the Raw and Half & Half. Yumm!! I like it with cream and sugar. From Starbucks, I have a serious wekaness for pumpkin spice lattes. I am now following on Blogger. I like my coffee black so I can enjoy the flavor. Mmmm...coffee. I love it really strong with lots of cream & sugar. A vanilla latte at Starbucks is like heaven on earth. I like my coffee with just half a packet of sweet'n low! Mmmm...coffee. If I'm drinking it from home I have about half a cup of milk and half a cup of coffee. lol. If I'm having it out somewhere, I just order a latte. Mochas are good too if I need a little chocolate fix. Thanks for the giveaway! I like 4 equals and lots of half and half. That's what wakes me up. Hot (no iced here), and with a fair amount of one of the different flavors of liquid creamer. The holidays are especially fun as different, holiday flavors are available! I like some every morning with flavored creamer in it. -usually non-fat French Vanilla. But I'm not picky and use what ever is there. I like my coffee black!!! I like it with cream and equal. I like my coffee with chocolate in it like mochas. I like my cream and sugar with a little coffee! I like mine with the cow, uh, creamer and lots of it. Since an IV would be inconvenient in the bedroom, I set my coffee on timer to grind and brew while I shower. The aroma draws me downstairs to the kitchen for that delicious first sip to the morning news. My travel mug in hand, I take on the day.